Donate Now to the Rachel Corrie Gaza Sport Initiative! The Rachel Corrie Gaza Sport Initiative is an annual project, consisting of the Rachel Corrie Ramadan Football Tournaments (Young Men and Juniors) and the Rachel Corrie Tournament for Athletes with Disabilities. These events provide a safe space for sport enthusiasts to gather through athletic events and for neighbors to come together. The projects are a success when athletes, their families, and friends come together to create a level of enjoyment, play and community as a counterforce to the persistent pressures of military occupation and closure of the Gaza Strip. 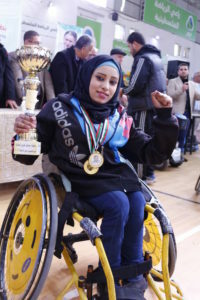 The Tournament for Athletes with Disabilities helps connect those with disabilities to the broader Palestinian society, affirms the place of the disabled in Gaza, and provides an avenue of accomplishment and fun in the sphere of athletics. It also provides an opportunity for female athletes to participate in a public forum. December 3rd is International Day of Persons with Disabilities.The tournament highlights the international focus on persons with disabilities and connects Gaza’s disabled population to those in other parts of the world. In partnership with Gaza’s Al Basma Club for the Disabled, the Rachel Corrie Foundation has organized the Tournament for Athletes with Disabilities since 2014. In 2016, 172 disabled athletes, including 55 women, participated in exciting competitions of football, wheelchair basketball, table tennis and goal ball (the most popular sport for the blind in Palestine). The Tournament provides a sport venue to showcase the skills of athletes who are deaf, amputees, paraplegics, or have suffered from polio. Donate Now to the Rachel Corrie Tournament for Athletes with Disabilities! Sharing tournament progression and winners on social media platforms. A closing ceremony will be held in conjunction with the Young Men’s Tournament. 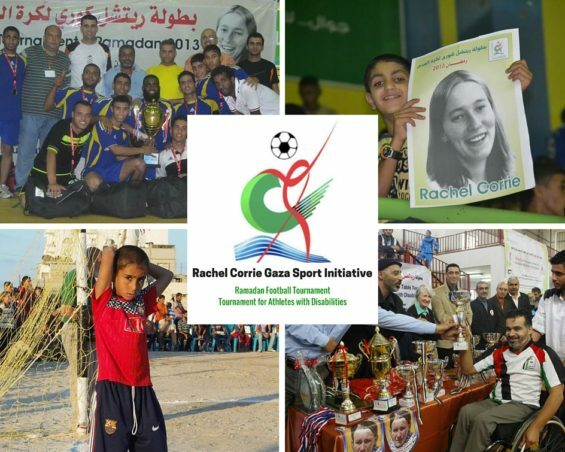 Donate Now to the Rachel Corrie Ramadan Football Tournament! Follow the 2017 Tournaments on Social Media for updates! Read the rest of their letter here to find out why the tournament is important to Rachel’s family and community. Read the rest of his article at the The Palestine Chronicle. Please consider a donation to our Rachel Corrie Foundation Gaza Projects to support the Rachel Corrie Gaza Sport Initiative and all our efforts in Gaza. Your donation helps to maintain a commitment to the communities of Gaza. Donations to the Rachel Corrie Foundation for this purpose are tax deductible, and any amount is appreciated! Donate Now, select “Rachel Corrie Gaza Sport Initiative” in the drop-down menu). Click on the photo to read the history. Our two Gaza Ramadan Tournaments began shortly after the international soccer organization (FIFA) failed to address violations of FIFA regulations by Israeli soccer teams based in or playing in Israeli settlements in the occupied West Bank. 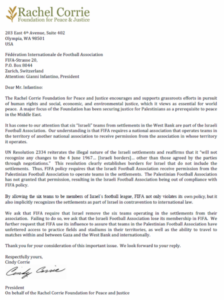 Read the letter sent to FIFA President, Gianni Infantino, on June 28th, 2017 by clicking on the photo.